800 Cleanfire® Engine: The 800 Cleanfire engine available in this sled is a liquid-cooled twin with semi-direct injection (SDI). This engine provides outstanding throttle response and instant acceleration for deep snow riders. This powerful, efficient engine starts easily and reliably, calibrates automatically with changes in temperature and elevation, and delivers impressive fuel economy in real-world riding situations. Optional Security System: This accessory Security System, which a Polaris dealer can install in conjunction with the RMK models’ instrumentation, prevents unauthorized drive-away of an idling sled. QuickDrive™ Low Inertia Drive System: The QuickDrive Low Inertia Drive System provides quicker acceleration and increased “flickability” through reduced rotating mass. Not simply a belt-drive, it is a complete lightweight drive system, complete with: an extruded drive shaft, lightweight brake, RMK-specific brake caliper and the most visible piece of the system – a maintenance-free belt drive that requires no oil or tensioner system. The complete system reduces rotational inertia by 21%, which means 5-pounds less effort when carving. Pro-Lite Seat: This purpose-built deep snow seat is sized so it’s easy for a rider to swing a leg from side to side. Its flat, wide area provides comfortable seated riding. Walker Evans® Coil-Over Shocks: The premium Walker Evans shocks on PRO-RMK models feature a rebuildable, IFP (internal floating piston), mono-tube design. Adhesive Bonded Suspension Components: Using advanced technology and sophisticated manufacturing processes, Polaris succeeds in building sleds that are lighter and stronger. The bonded Lower Control Arms feature forged aluminum ends and steel tubing, resulting in the set of control arms weighing 2 pounds less than welded steel control arms. Minimized Weight: In 2011, the Polaris PRO-RMK® 155 weighed 431 pounds. 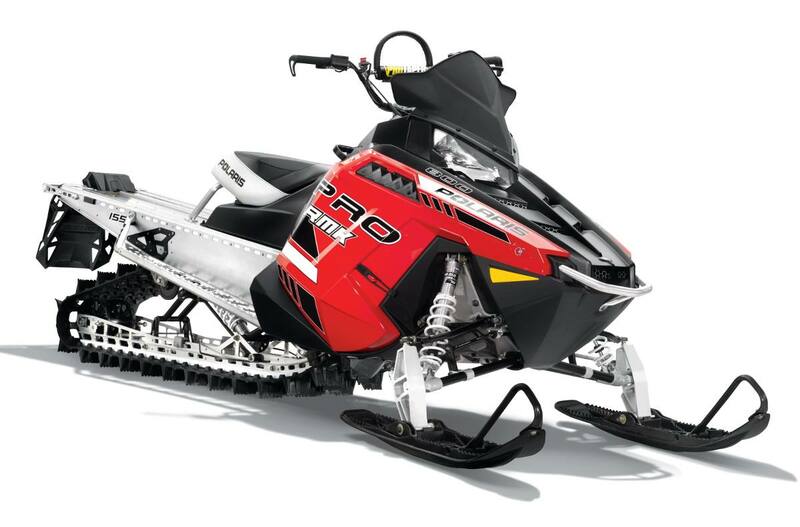 A 2014 PRO-RMK 155 model weighs 417 pounds – and is stronger than the earlier models. This is low weight normally only achieved by purchasing expensive, one-off custom mountain sleds. PRO-RIDE™ Chassis with Carbon Fiber Overstructure: Confidence comes standard. A sled that responds to a rider’s every input is a sled a rider can trust. From technical tree riding to a demanding sidehill and turn-out, the PRO-RIDE Chassis helps improve riders’ skills and enjoyment. The enhanced weight transfer produces Rider Active Control, and the 300% more rigid chassis results in more precise handling. Plus, the carbon fiber overstructure reduces weight without compromising strength. Coil-Over Rear Suspension: This skid is a favorite among deep snow riders for the way it quickly gets up on the snow and allows a rider to outclimb and sidehill with greater control than buddies on competitive sleds. This skid provides excellent flotation and deep snow performance, and an impressive on-trail ride. The torque arm redesign and torsion springs elimination cut the sled weight substantially. The easily adjustable spring preload lets a rider customize the set-up for the day’s conditions. RAW Refined: Everything that can be lighter – without compromising strength – is lighter, including: The low-profile LED taillight, lightweight punched snow flap with hand access, carbon fiber bumper with extruded billet mounts, and narrower tunnel cooling extrusions. Lightweight Silencer: The innovative silencer design minimizes weight and effectively keeps noise levels in check.